Done correctly, a good gnocchi should be light, soft, delicate. It should have a smooth mouthfeel. Done poorly, you get little potato torpedos that are dense and chewy. I’ve eaten from both ends of the spectrum. But there is something that is just so comforting about a gnocchi. 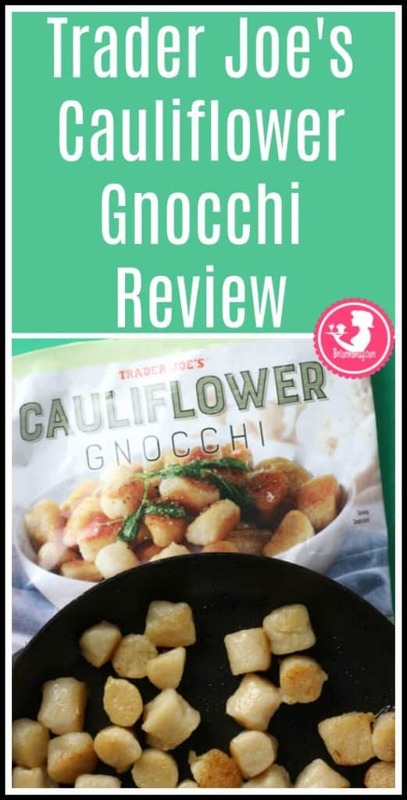 Now, on this blog I have tried my fair share of cauliflower related products including: Cauliflower Rice, Grilled Cauliflower, Rainbow Cauliflower, Cauliflower Pizza Crust and the gluten free one too, the seasonal Cauliflower Stuffing, Cauliflower Dip, Mashed Cauliflower, and a slew of other items have entered my shopping cart and belly. Some are just cauliflower. Some are parading around as a product that is not traditionally done as cauliflower. The results are a bit mixed. For some reason, the products that were pretending to be something else, I did not love. I knew very much that they were the substitute and not the real thing. Oh so different. In all the best ways possible. So, let’s revisit that list of ethereal things that potato gnocchi is: soft, delicate, smooth, and light. Is this product soft? Yes, these are pillowy soft. Is this delicate? It’s delicate enough to stand up to a good saute without falling apart. It got a good crust which added flavor. Is it smooth? Yes, there did not seem to be any chunks of cauliflower for added texture. These were as smooth as they get. It is light? Not quite as light as the potato ones, but good enough. This product smells of cauliflower as you open the bag, but the flavor mellows upon cooking. 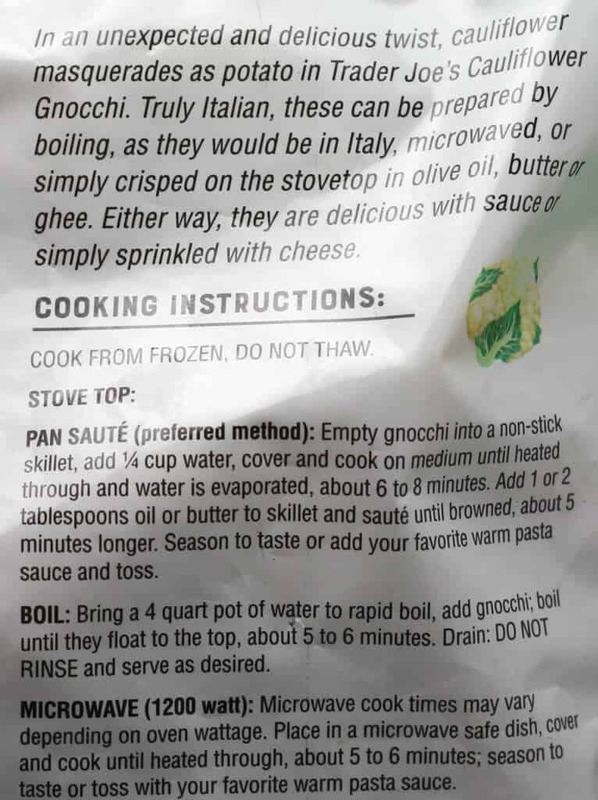 I only had a chance to pan saute this. And I’m not sure I would try this any other way. I found myself picking these right out of the pan and consuming them. They were good. But I never felt like it was a substitute. I felt like it was teetering on an improvement. I know, that might also teeter on a bit of blasphemy being married to an Italian, but these were on point. I, in no way felt like I was missing out or having a substitute (where my head and stomach are saying, “please eat the real thing”). If I were to sit and consume the whole bag, it would be 330 calories. In this bag, it’s not hard to eat one whole bag as a dinner portion. It could be split as two sides, but it would be hard to push this little bag beyond that. For the first time, I felt like I was enjoying the substitute as much as the original. I really liked these. They’re a touch more expensive than the potato gnocchi found on the shelf. These are priced at $2.69 for a 12 ounce bag. If I had to complain about anything, I’d like to complain that these will likely be in short supply (as are most new cauliflower products at TJs). But also, this product is not labeled as being gluten-free. It’s not organic, but otherwise, this has been one of my favorite new items this year. Would I buy this again? 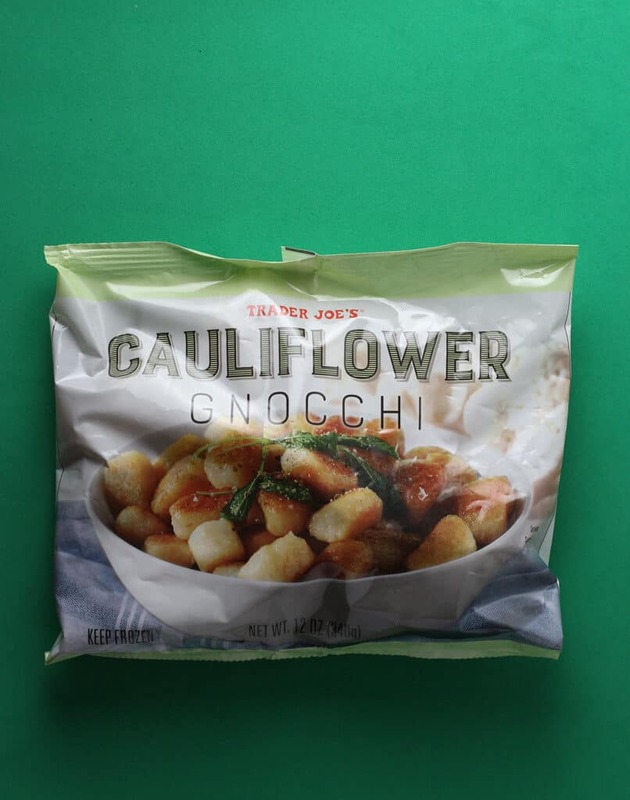 Yes, I would buy Trader Joe’s Cauliflower Gnocchi again and again and again. It’s the first product that I thought was very, very close to the original. 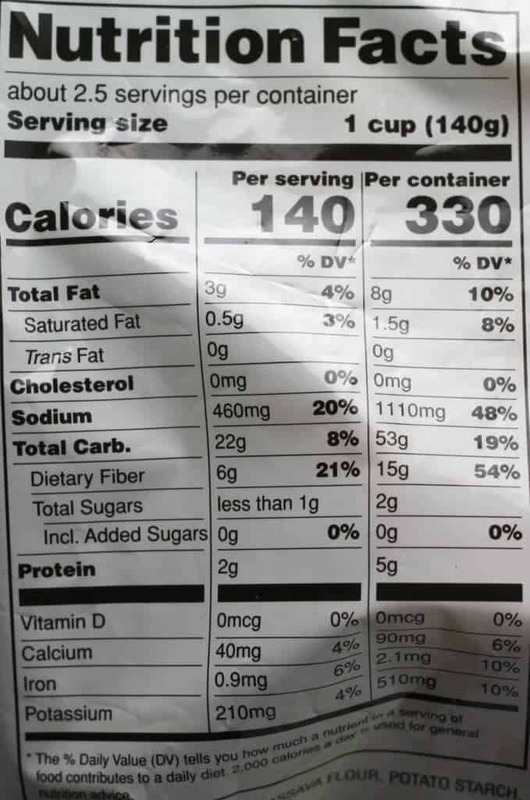 At 330 calories for the entire bag, it’s reduced guilt on eating a product that I can easily overeat. 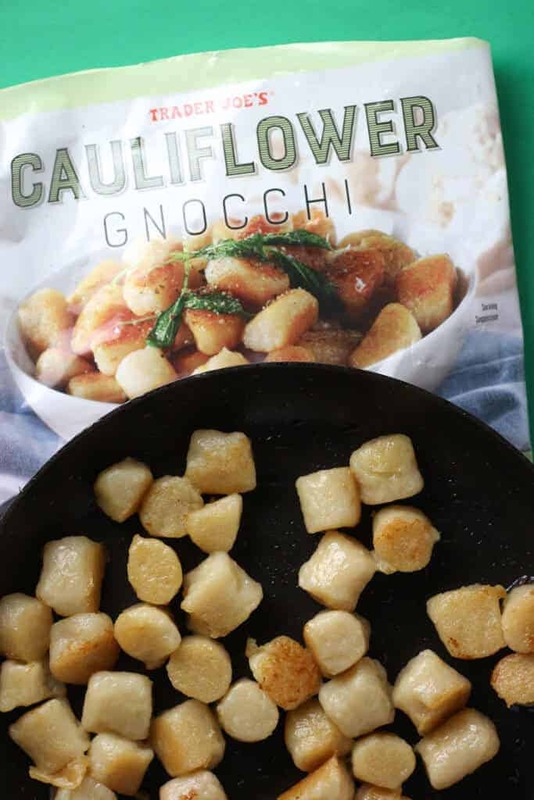 Trader Joe’s Cauliflower Gnocchi does a great job of emulating the more carb heavy “regular” gnocchi. However, be mindful of how you cook this. Sautéing this is key to success. 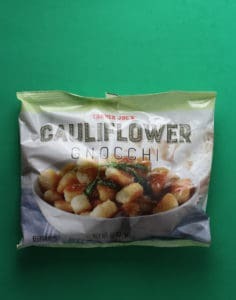 Trader Joe’s Cauliflower Gnocchi is quite possibly the best cauliflower “substitute” product to date. This is not organic or labeled as being gluten-free. Don’t microwave it. Sautéing is key. Once people try this, I predict it will be a while before I see this on shelves again. Just checking- they seem to be Gluten free but does anyone know for sure? I hope that helps. Sorry I can’t provide a better answer for you.